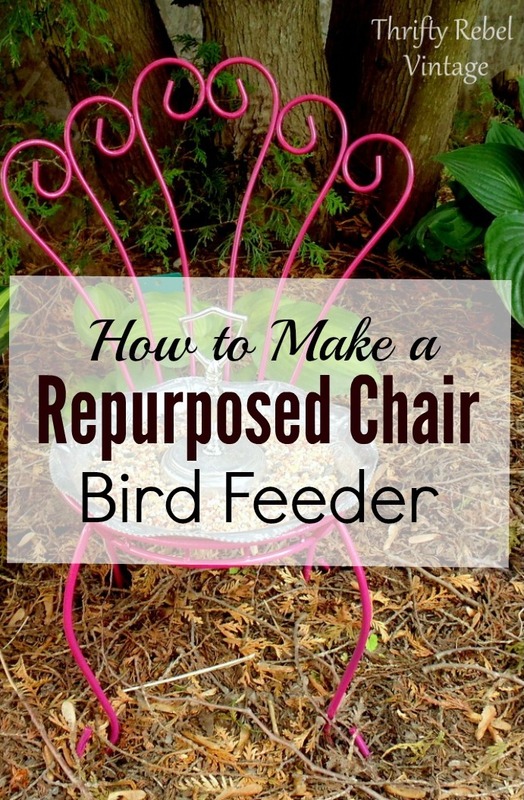 Give your feathered friends a fun place to rest their wings while grabbing a snack with a diy repurposed chair bird feeder. Having whimsical pieces in the garden is something I love, and when I can feed our visiting birdies at the same time that just makes it even better. 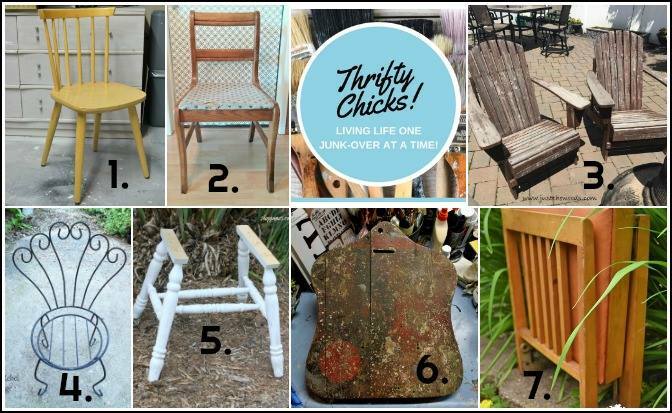 When I was going through my greenhouse storage recently I found an old chair, and I thought it would be perfect for this first Thrifty Chicks project challenge. On the second Wednesday of each month I’ll be joining some very talented blogging friends for project challenges, and with a different theme each time it’s going to be a lot of fun. 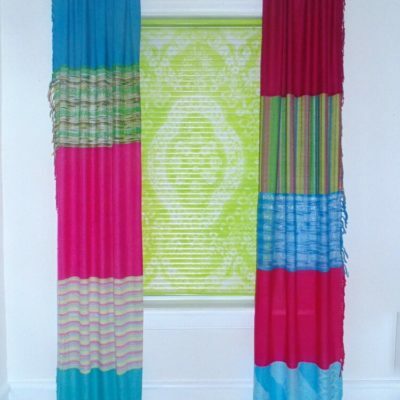 There are links at the end of this post to all of their fabulous projects so be sure to check them out. As you’ve probably already guessed this month’s challenge is a chair project. 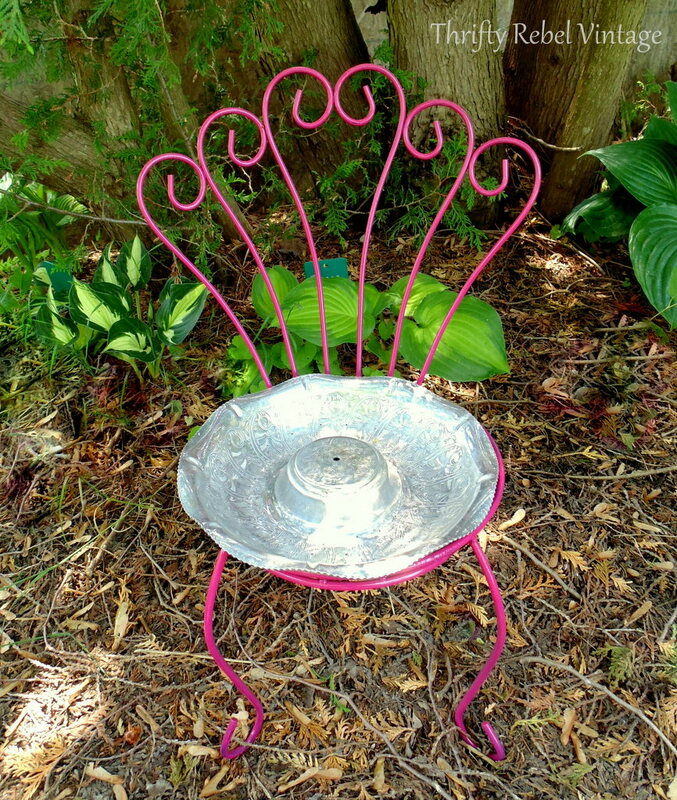 We could makeover, upcycle, or repurpose a whole chair or parts of a chair. Anything to do with a chair really. 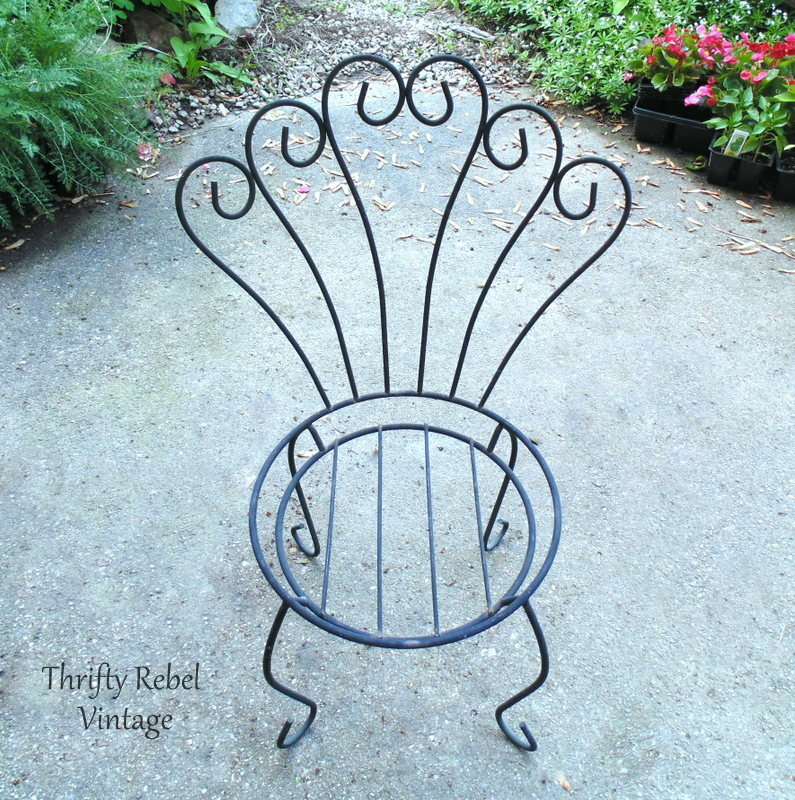 I have a soft spot for curlicues, and I found this adorable small child-size black wrought iron chair a few years ago. It’s quite strong so I think with a nice cushion it may have been a little girl’s vanity chair at some point. Spray paint the chair the colour of your choice. I chose a bright pink. Then find a nice quiet place where you think the birds might like to stop for a snack. We don’t have a squirrel problem here so I’m putting mine in a nice shaded garden spot. Now it needs something to hold the bird seed. This aluminum serving tray from my stashes was a perfect fit. 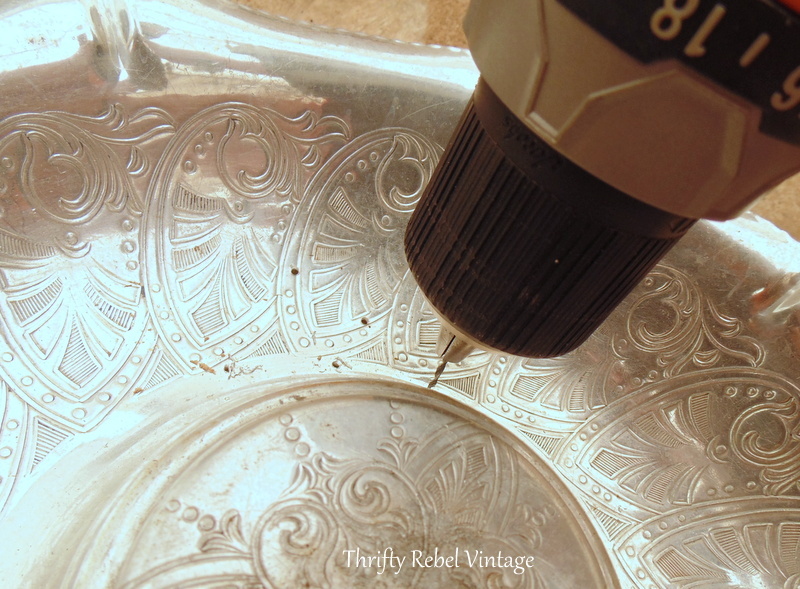 I grabbed my drill and a 1/32″ metal drill bit and drilled small holes for drainage. 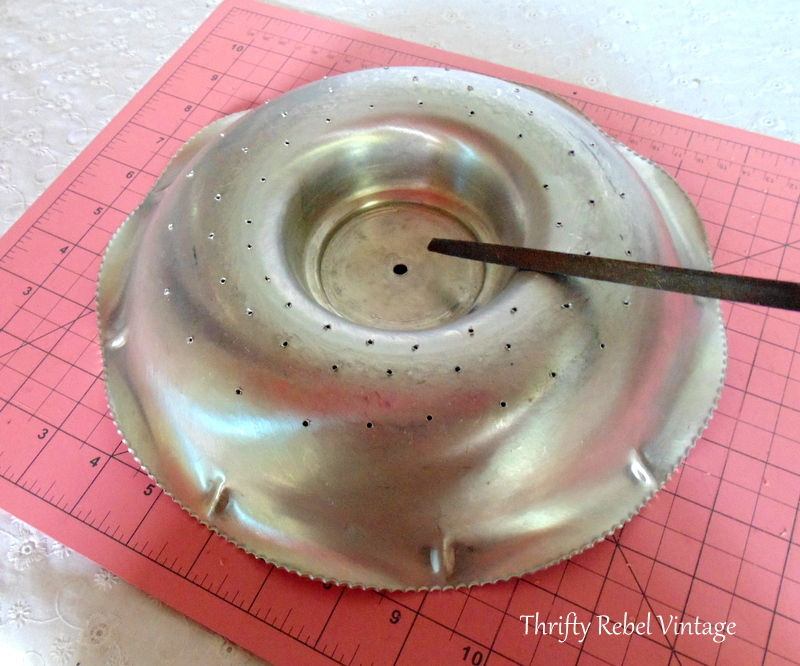 As I drilled each hole I positioned my tray so the area where I was drilling was flat on the spare piece of wood that I use for these kinds of projects. Always always always wear eye protection when drilling into any metals, and be gentle with the pressure or you’ll end up with a broken drill bit. Don’t ask me how I know. 🙂 Let’s just say I’ve broken a few in my day, and I’ve learned by trial and error. Thankfully this was a broken bit-free project. Here’s a good look at how many holes I drilled. You don’t want any birdies stubbing their toes against any rough bits of metal, so be sure to drill from the inside down. This also makes it easy to remove the rough edges with a file or a rasp for safe handling in the future. Place your feed tray inside. And fill it with whatever mix of seeds your feathered friends prefer. Because I removed the top thingy on the tray I thought it needed a little something extra. So I went into my stashes and found a tiered stand handle that I just screwed through the existing hole. This gives the birds something else to perch on, and I like how it looks. 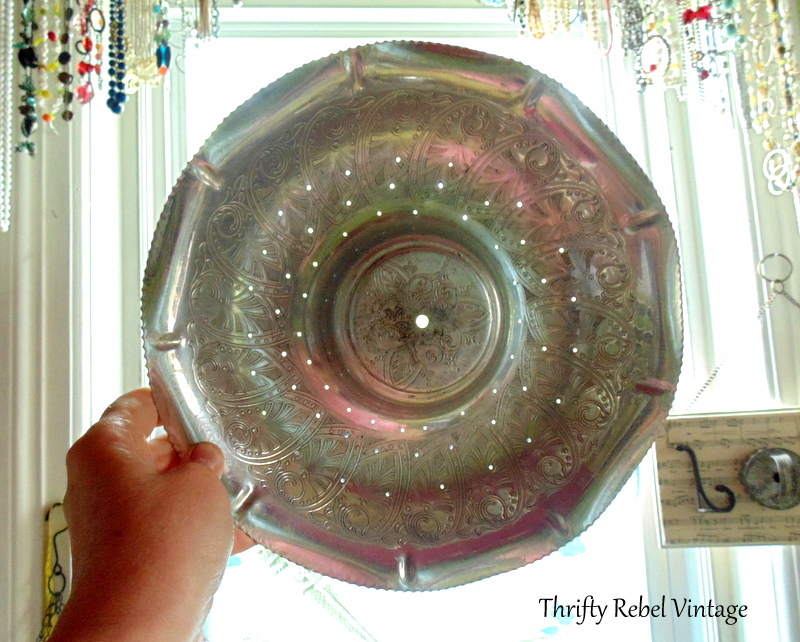 If I could find a glass dish just the right size this could easily be a bird bath as well. I had my first sighting at my chair bird feeder yesterday, but by the time I went to grab my camera it was gone. 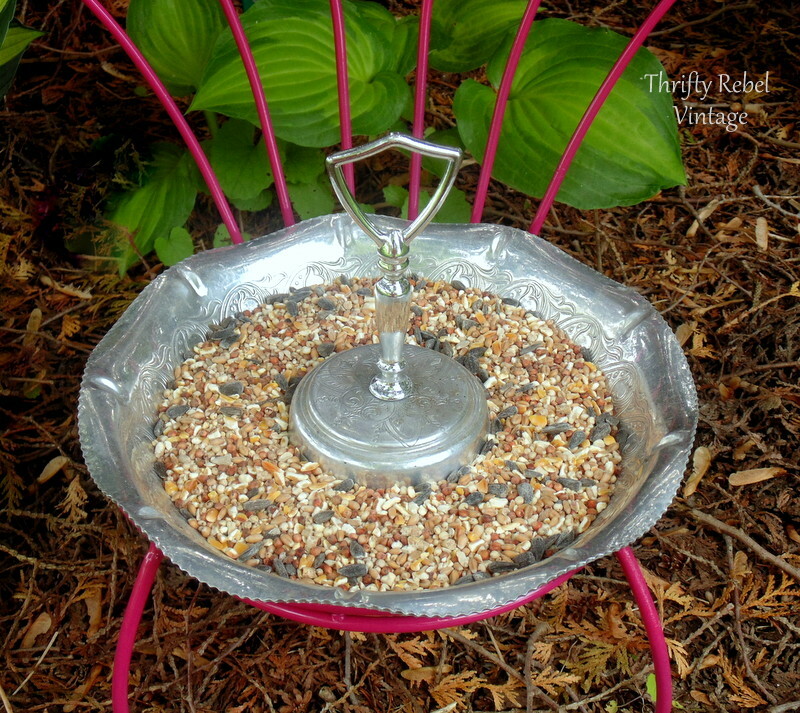 If you enjoyed this bird feeder project you might also enjoy my repurposed tiered stand bird feeder, and my repurppsed vintage sieve bird feeder. Now be sure to check out what my friends did with their chair projects. Just click on the links beside the blog names. Thanks Dona! I hope so, because I love them. What a sweet chair! And you made it even sweeter by making it a gift to the birdies. LOVE the color! 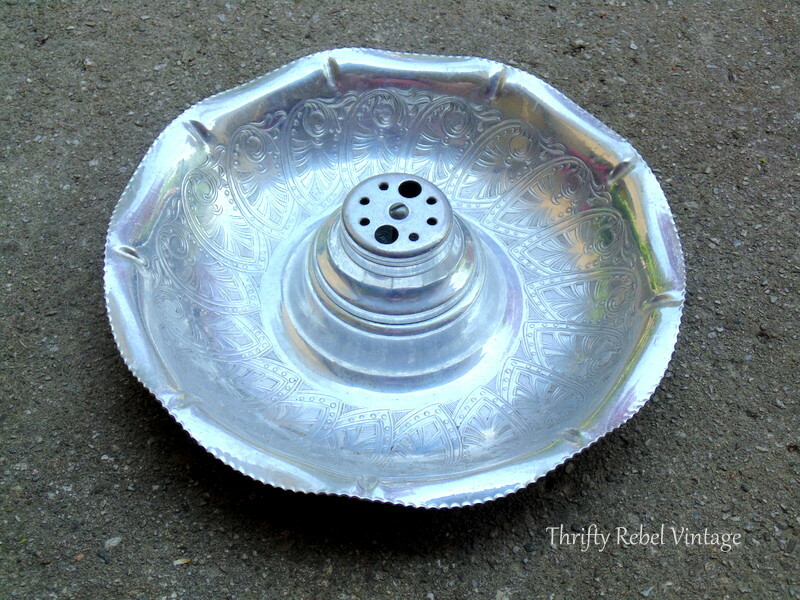 I have been spray painting lately without good results….I had to go back and reread your 10 tips! 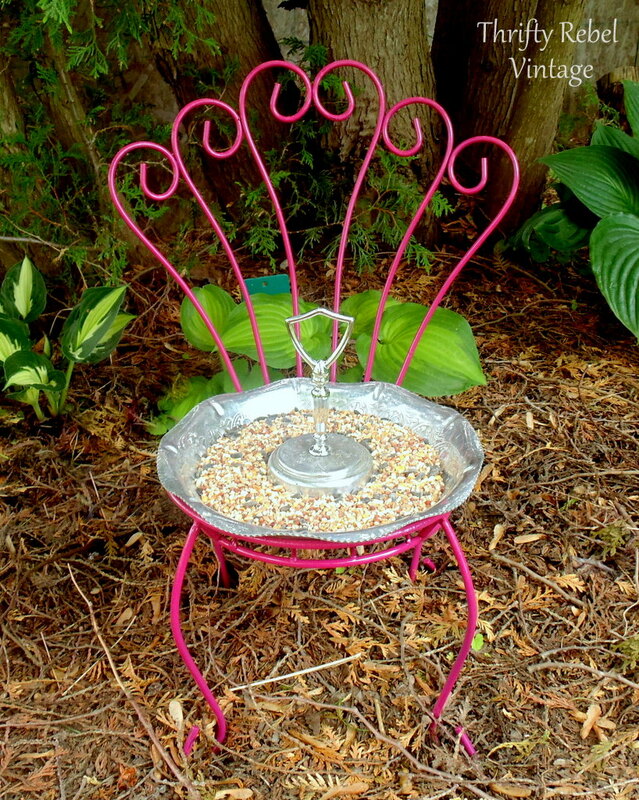 Great idea and the birds will love it but one thing; with the bird feeder chair sitting in your hosta bed you will have all kinds of bird seed weeds coming up in your beautiful flower bed. I have leaned not to but a bird feeder in flower beds. Bird waters yes, bird feeders not so good, as I was constantly pulling weeds long after I moved the feeder to another location. Thanks Colleen! That has never been a problem for us and we have hung bird feeders from trees over gardens and had them in the middle of the lawn, and other gardens. I think the type that we buy is baked because that apparently stops the seed’s ability to sprout. All I can say is we’ve never had sprouting bird seed happen anywhere. The birds can spread it wherever they want, and they do, lol, and it’s not a problem. They usually clean up whatever mess they make. I can only imagine what kind of pain that must be to be picking those weeds. You might want to check the type of bird seed that’s available in your area. Thanks Florence! No thanks. lol. We do have the off raccoon passing through, but they don’t stick around. Mostly bunnies around here and they don’t seem to bother the bird seed. WOW…..that looks great. I like the idea of a bird bath, too. I read somewhere that bees like to have water also. I have a shallow container & I put rocks in it for them to land on. I’m sure birds use it too…have not seen any bees yet. Not sure if I read, & saw photos about it on Pinterest or where exactly. I also found a very shallow glass thing for water, thinking hummingbirds might like a drink, too. Looks nice hanging it a tree, Problem being, it needs to be filled a couple times a day & I forget about it!!! I think I just like to hang things in my tees…..feeders, wind chimes, flowers baskets, hummingbird feeders, actually just about anything. For Easter, I went to thrift stores & Goodwill & picked up about 25 straw or plastic Easter baskets & hung them all in a tree. Someone came by & put those plastic Easter eggs in them. I came home & saw the eggs on the ground all around the tree. 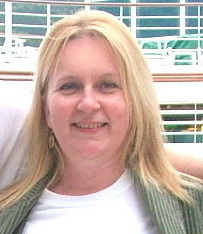 It was very windy that day, otherwise I wouldn’t have noticed them till I took them down. Must have been the Easter Bunny!!! When Halloween gets here, I’ll hang orange plastic pumpkins. Through out the year I pick up things to hang for Christmas, also. You’d be surprised what you can find. Thanks Linda! I never knew that bees like water too, but I guess every living thing needs to drink. I’ve never seen on in any of our bird baths. I totally agree that it is fun to hang things in the trees. This is so sweet. 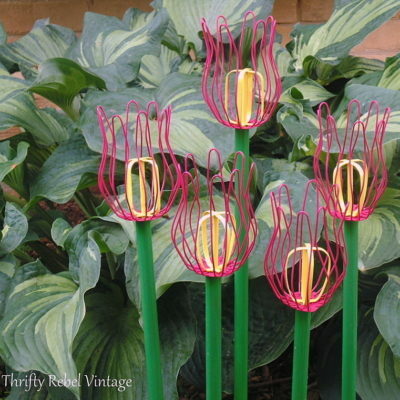 I love the color, it makes me think of flamingos. I bet the birds love their stylish new feeder. Thanks Debra! It does look like the colour of pink flamingoes. Maybe that’s why the birds are liking it. lol. Awww, I just love this Tuula! What lucky birdies you’ll have in your yard! I LOVE this Tuula! 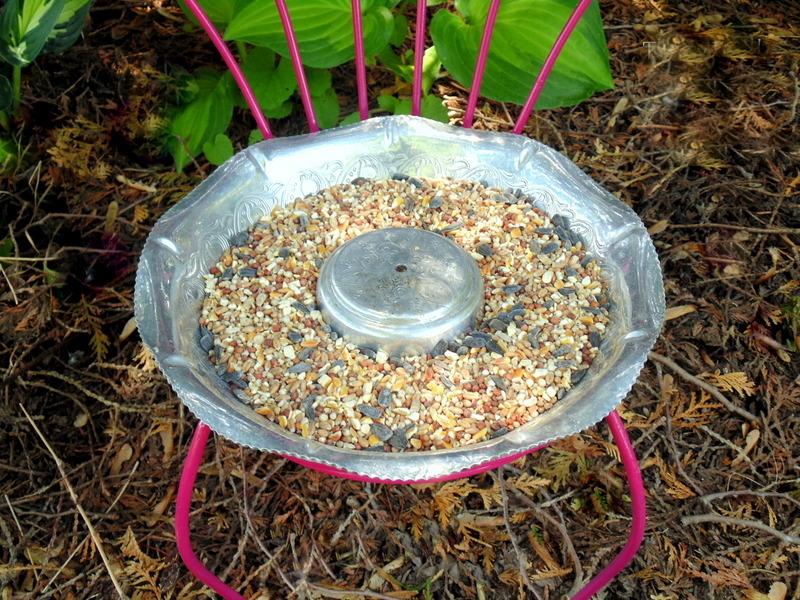 Love the color first off but how clever to repurpose a deep serving tray as a bird feeder. The stem perch is adorable too. Thanks Marie! I love to have hits of fun colour in the hosta gardens, and pink is always a go to for me. this is so cute to start and then the fun pop of pink makes it even better!! Thanks Kandice! So far a few birds are liking it. Hopefully word will spread throughout the land. lol. Soooooo cute Tuula. What a clever idea. Love this series and all the creative inspiration. Happy Wednesday. Thanks very much Diana! I didn’t see that, but now that you mention it the back does kind of look like peacock feathers. Well, I guess this one is a pink peacock. lol. 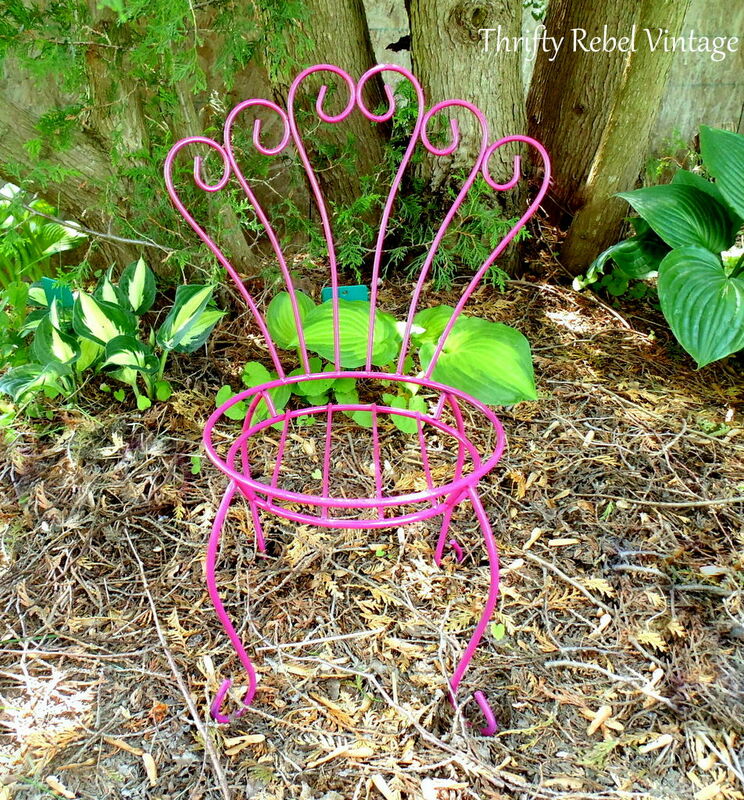 Oh, I so wish I didn’t have a squirrel issue and could do something like this, but they’re everywhere in my yard:( Love the pink paint…and your hostas! Thanks very much Lora! Yes, we’re lucky with the squirrel thing. We haven’t seen one in years. Makes it so much easier to feed the birdies.